If the ankle ligaments do not heal adequately, you may end up with ankle instability. This can cause the ankle to give way and feel untrustworthy on uneven terrain. If your ankle ligaments do not heal adequately following an ankle sprain, your doctor may suggest several things. Changes in your footwear may be prescribed to help keep your ankle from turning in. Placing a heel wedge under the outer half of your heel blocks the ankle from rolling, as does a flared heel built into your shoe. In extreme cases, doctors may prescribe a plastic brace, called an orthosis, to firmly hold your ankle from rocking side to side. Some patients feel a sense of steadiness from wearing high-topped shoes. Patients with ankleinstability should avoid wearing high-heeled shoes. Small nerve sensors inside the ligament are injured when a ligament is stretched or torn. These nerve sensors give your brain information about the position of your joints, a sensation called position sense. For example, nerve sensors in your arm and hand give you the ability to touch your nose when your eyes are closed. The ligaments in the ankle work the same way. They send information to your nervous system to alert you about the position of your ankle joint. A physical therapist will help you retrain this sensation as a way to steady the ankle joint and protect you from spraining your ankle again. Many people who have ankle instability have weakness in the muscles along the outside of the leg and ankle. These are called the peroneal muscles. Strengthening these muscles may help control the ankle joint and improve joint stability. Ankle instability is a condition characterised by the ankle ‘giving way’ or feeling wobbly and unreliable, particularly on uneven surfaces. There are two main ligaments that support the ankle. The outer ligaments, known as the lateral ligaments, have three components which stop the ankle from rolling and sliding forward. These ligaments are attached to the fibula (small bone next to the shin bone) and the talus (the ankle bone) and calcaneus (heel bone). An ankle sprain stretches and tears these ligaments and if the sprain doesn’t heal properly, ankle instability can develop. Chronic ankle instability usually develops following an ankle sprain that was not diagnosed properly or has not healed. An ankle sprain stretches and tears the connective tissues, known as the ligaments. When this occurs, small nerve sensors inside the ligament are often damaged. These nerve sensors, called the proprioceptive nerves, give your brain information about the position of your joints, allowing you to move and protect these joints. For example, nerve sensors in the arm and hand allow you to touch your nose when your eyes are closed. If these nerve endings are not working properly, your brain does not get reliable information and the muscles around your ankle may not work together properly. This causes your ankle to “give way”, often with minor stresses. 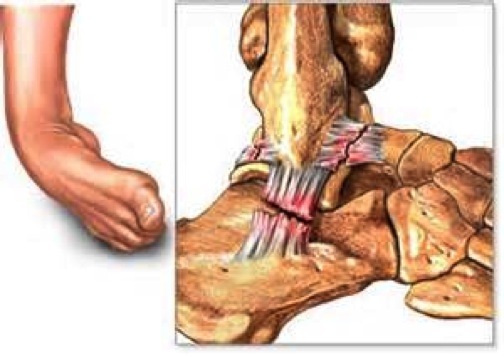 Ankle instability makes you more prone to ankle sprains, which in turn exacerbate ankle instability. With each ankle sprain, the ligaments are increasingly weakened. If your ankle feels unreliable and gives way repeatedly, or if you have recurring ankle sprains, it is recommended that you have a full assessment by a foot and ankle surgeon. Your foot will be examined for signs of swelling and tenderness. By stretching your ankle in different directions, the surgeon will be able to see whether the ligaments are abnormally weak. This is known as a stress view. The surgeon may take x-rays to check whether there is any damage to the ankle bones. An MRI scan may also be taken. Treatment depends upon the severity of the ankle instability and the patient’s own activity levels. Changes in your footwear may be prescribed to help keep your ankle from turning in. Placing a heel wedge under the outer half of your heel blocks the ankle from rolling, as does a flared heel built into your shoe. In extreme cases, doctors may prescribe a plastic brace, called an orthosis, to firmly hold your ankle from rocking side to side. Some patients feel a sense of steadiness from wearing high-topped shoes. Patients with ankle instability should avoid wearing high-heeled shoes. Physical therapy treatments will likely be initiated to help restore joint range of motion, strength, and joint stability. Small nerve sensors inside the ligament are injured when a ligament is stretched or torn. These nerve sensors give your brain information about the position of your joints, a sensation called position sense. For example, nerve sensors in your arm and hand give you the ability to touch your nose when your eyes are closed. The ligaments in the ankle work the same way. They send information to your nervous system to alert you about the position of your ankle joint. A physical therapist will help you retrain this sensation as a way to steady the ankle joint and protect you from spraining your ankle again. Many people who have ankle instability have weakness in the muscles along the outside of the leg and ankle. These are called the peroneal muscles. Strengthening these muscles may help control the ankle joint and improve joint stability. The damaged ligaments may be tightened and re-attached to the bone. Known as the Brostrum’s procedure, this type of operation is highly successful and is appropriate for people with active lifestyles. 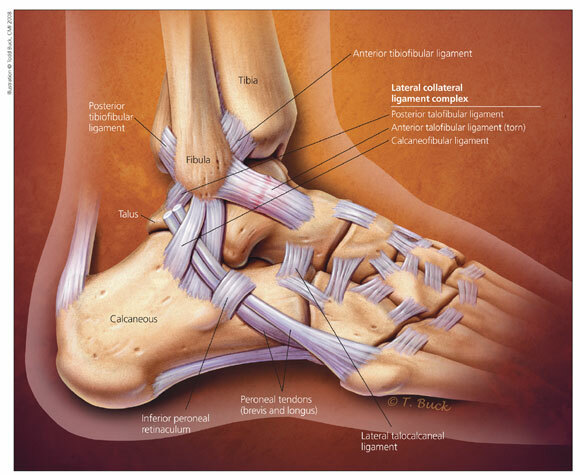 This procedure involves cutting the stretched out ligaments (anterior talofibular ligament and calcaneofibular ligament) on the outside of the ankle and repairing them in a tightened position. Another type of reconstruction is done using a tendon graft. If your surgeon feels that the stretched and scarred ligaments are not strong enough to simply repair in a ligament tightening procedure, then the ligaments must be reinforced with a tendon graft. In this procedure, the surgeon removes a portion of one of the nearby tendons to use as a tendon graft. 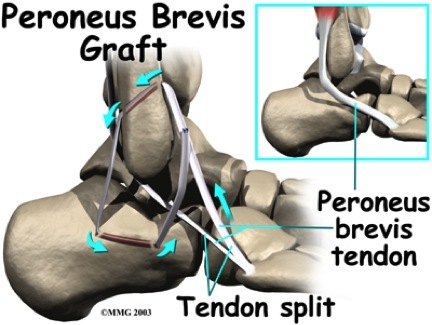 The tendon most commonly used attaches the peroneus brevis muscle to the outside edge of the small toe. A section of this tendon is put in place of the torn lateral ligaments. After making the skin incision, the surgeon drills a hole in the fibula near the attachment of the original ligament. 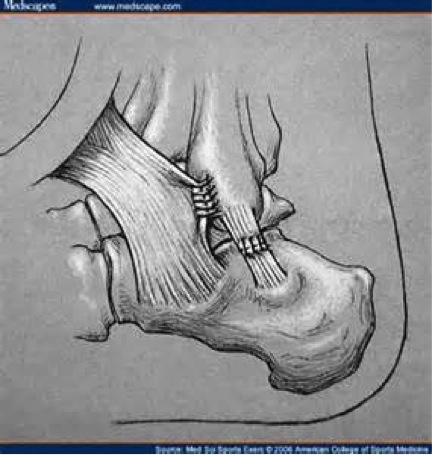 A second drill hole is made in the area where the ligament attaches on the talus (the anklebone). 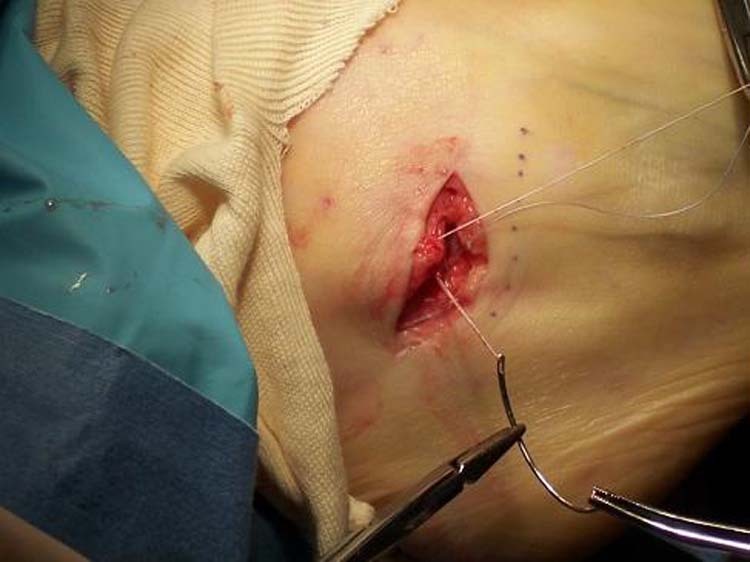 The tendon graft is then removed (or harvested) and woven between these holes to recreate the ligament complex. After surgery, you will probably be placed in a cast or brace for about six weeks to allow the tendon reconstruction to heal. Following removal of the cast, physical therapy will be required to regain full use of the ankle.